If a message, m, is delivered by one server, it will be eventually delivered by all servers. If a message is delivered before message b by one server, a will be delivered before b by all servers. If a and b are delivered messages, either a will be delivered before b or b will be delivered before a. If a message b is sent after a message a has been delivered by the sender of b, a must be ordered before b. If a sender sends c after sending b, c must be ordered after b. The ZooKeeper messaging system also needs to be efficient, reliable, and easy to implement and maintain. We make heavy use of messaging, so we need the system to be able to handle thousands of requests per second. Although we can require at least k+1 correct servers to send new messages, we must be able to recover from correlated failures such as power outages. When we implemented the system we had little time and few engineering resources, so we needed a protocol that is accessible to engineers and is easy to implement. We found that our protocol satisfied all of these goals. Once a FIFO channel is closed, no messages will be received from it. FLP proved that consensus cannot be achieved in asynchronous distributed systems if failures are possible. To ensure we achieve consensus in the presence of failures we use timeouts. However, we rely on times for liveness not for correctness. So, if timeouts stop working (clocks malfunction for example) the messaging system may hang, but it will not violate its guarantees. a unit of agreement. Proposals are agreed upon by exchanging packets with a quorum of ZooKeeper servers. Most proposals contain messages, however the NEW_LEADER proposal is an example of a proposal that does not correspond to a message. a sequence of bytes to be atomically broadcast to all ZooKeeper servers. A message put into a proposal and agreed upon before it is delivered. As stated above, ZooKeeper guarantees a total order of messages, and it also guarantees a total order of proposals. ZooKeeper exposes the total ordering using a ZooKeeper transaction id (zxid). All proposals will be stamped with a zxid when it is proposed and exactly reflects the total ordering. Proposals are sent to all ZooKeeper servers and committed when a quorum of them acknowledge the proposal. If a proposal contains a message, the message will be delivered when the proposal is committed. Acknowledgement means the server has recorded the proposal to persistent storage. Our quorums have the requirement that any pair of quorum must have at least one server in common. We ensure this by requiring that all quorums have size (n/2+1) where n is the number of servers that make up a ZooKeeper service. The zxid has two parts: the epoch and a counter. In our implementation the zxid is a 64-bit number. We use the high order 32-bits for the epoch and the low order 32-bits for the counter. Because it has two parts represent the zxid both as a number and as a pair of integers, (epoch, count). The epoch number represents a change in leadership. Each time a new leader comes into power it will have its own epoch number. We have a simple algorithm to assign a unique zxid to a proposal: the leader simply increments the zxid to obtain a unique zxid for each proposal. Leadership activation will ensure that only one leader uses a given epoch, so our simple algorithm guarantees that every proposal will have a unique id. In this phase a leader establishes the correct state of the system and gets ready to start making proposals. In this phase a leader accepts messages to propose and coordinates message delivery. The leader has seen the highest zxid of all the followers. A quorum of servers have committed to following the leader. Of these two requirements only the first, the highest zxid amoung the followers needs to hold for correct operation. The second requirement, a quorum of followers, just needs to hold with high probability. We are going to recheck the second requirement, so if a failure happens during or after the leader election and quorum is lost, we will recover by abandoning leader activation and running another election. After leader election a single server will be designated as a leader and start waiting for followers to connect. The rest of the servers will try to connect to the leader. The leader will sync up with followers by sending any proposals they are missing, or if a follower is missing too many proposals, it will send a full snapshot of the state to the follower. There is a corner case in which a follower that has proposals, U, not seen by a leader arrives. Proposals are seen in order, so the proposals of U will have a zxids higher than zxids seen by the leader. The follower must have arrived after the leader election, otherwise the follower would have been elected leader given that it has seen a higher zxid. Since committed proposals must be seen by a quorum of servers, and a quorum of servers that elected the leader did not see U, the proposals of you have not been committed, so they can be discarded. When the follower connects to the leader, the leader will tell the follower to discard U. A new leader establishes a zxid to start using for new proposals by getting the epoch, e, of the highest zxid it has seen and setting the next zxid to use to be (e+1, 0), fter the leader syncs with a follower, it will propose a NEW_LEADER proposal. Once the NEW_LEADER proposal has been committed, the leader will activate and start receiving and issuing proposals. A follower will ACK the NEW_LEADER proposal after it has synced with the leader. A follower will only ACK a NEW_LEADER proposal with a given zxid from a single server. A new leader will COMMIT the NEW_LEADER proposal when a quorum of followers have ACKed it. 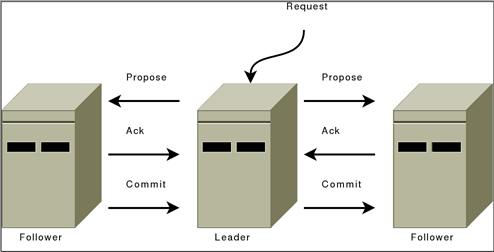 A follower will commit any state it received from the leader when the NEW_LEADER proposal is COMMIT. A new leader will not accept new proposals until the NEW_LEADER proposal has been COMMITED. If leader election terminates erroneously, we don't have a problem since the NEW_LEADER proposal will not be committed since the leader will not have quorum. When this happens, the leader and any remaining followers will timeout and go back to leader election. Leader Activation does all the heavy lifting. Once the leader is coronated he can start blasting out proposals. As long as he remains the leader no other leader can emerge since no other leader will be able to get a quorum of followers. If a new leader does emerge, it means that the leader has lost quorum, and the new leader will clean up any mess left over during her leadership activation. ZooKeeper messaging operates similar to a classic two-phase commit. The leader sends proposals to all followers using the same order. Moreover, this order follows the order in which requests have been received. Because we use FIFO channels this means that followers also receive proposals in order. Followers process messages in the order they are received. This means that messages will be ACKed in order and the leader will receive ACKs from followers in order, due to the FIFO channels. It also means that if message $m$ has been written to non-volatile storage, all messages that were proposed before $m$ have been written to non-volatile storage. The leader will issue a COMMIT to all followers as soon as a quorum of followers have ACKed a message. Since messages are ACKed in order, COMMITs will be sent by the leader as received by the followers in order. COMMITs are processed in order. Followers deliver a proposals message when that proposal is committed. So there you go. Why does it work? Specifically, why does is set of proposals believed by a new leader always contain any proposal that has actually been committed? First, all proposals have a unique zxid, so unlike other protocols, we never have to worry about two different values being proposed for the same zxid; followers (a leader is also a follower) see and record proposals in order; proposals are committed in order; there is only one active leader at a time since followers only follow a single leader at a time; a new leader has seen all committed proposals from the previous epoch since it has seen the highest zxid from a quorum of servers; any uncommited proposals from a previous epoch seen by a new leader will be committed by that leader before it becomes active. Isn't this just Multi-Paxos? No, Multi-Paxos requires some way of assuring that there is only a single coordinator. We do not count on such assurances. Instead we use the leader activation to recover from leadership change or old leaders believing they are still active. Isn't this just Paxos? Your active messaging phase looks just like phase 2 of Paxos? Actually, to us active messaging looks just like 2 phase commit without the need to handle aborts. Active messaging is different from both in the sense that it has cross proposal ordering requirements. If we do not maintain strict FIFO ordering of all packets, it all falls apart. Also, our leader activation phase is different from both of them. In particular, our use of epochs allows us to skip blocks of uncommitted proposals and to not worry about duplicate proposals for a given zxid. ZooKeeper uses log4j version 1.2 as its logging infrastructure. For information on configuring log4j for ZooKeeper, see the Logging section of the ZooKeeper Administrator's Guide. EBUG Level designates fine-grained informational events that are most useful to debug an application. TRACE Level designates finer-grained informational events than the DEBUG. ZooKeeper is typically run in production such that log messages of INFO level severity and higher (more severe) are output to the log. However when creating a message from a number of components (string concatenation), the log call should be wrapped with a "isXEnabled()" call. this eliminates the string concatenation overhead when debug level logging is not enabled.